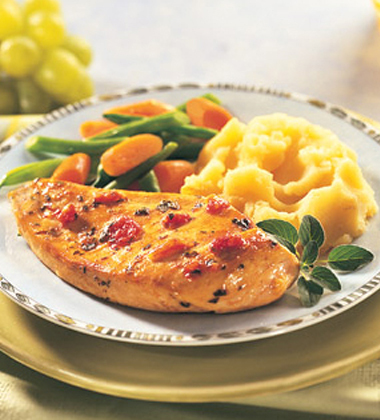 This double-duty marinade and basting sauce is made with Swanson® Unsalted Chicken Broth. With just the right amount of tomatoes, Parmesan cheese, garlic powder and Italian seasoning, it is a simple way to add great flavor to grilled or broiled chicken breasts. Parmesan cheese, grated	 0 oz. 4 tsp. Italian seasoning, crushed	 2 tsp. 1. Stir broth, tomatoes, cheese, Italian seasoning and garlic powder in a shallow nonmetallic dish or a resealable plastic bag. Add chicken and turn to coat. Cover dish or seal bag. Refrigerate for 30 minutes. 2. Lightly oil grill rack and heat to medium. Grill chicken for 15 minutes, or until cooked through. Turn over once halfway through grilling and brush often with broth mixture. Discard remaining broth mixture. mashed potatoes, hot	 89 oz. 3 qt. fresh mixed vegetables (broccoli, carrots, red or green peppers, snap peas, onions), cooked, hot	 77 oz. 3 qt. 3. To Serve: Using tongs, plate 1 cooked chicken breast with 1/2 cup (#8 scoop) mashed potatoes and 1/2 cup (4 oz spoodle) mixed vegetables. Parmesan cheese	 0.25 oz. 4 tsp. mashed potatoes	 89 oz. 3 qt. fresh mixed vegetables (broccoli, carrots, red or green peppers, snap peas, onions)	 77 oz. 3 qt. Cover chicken during hot holding to keep it from drying out.